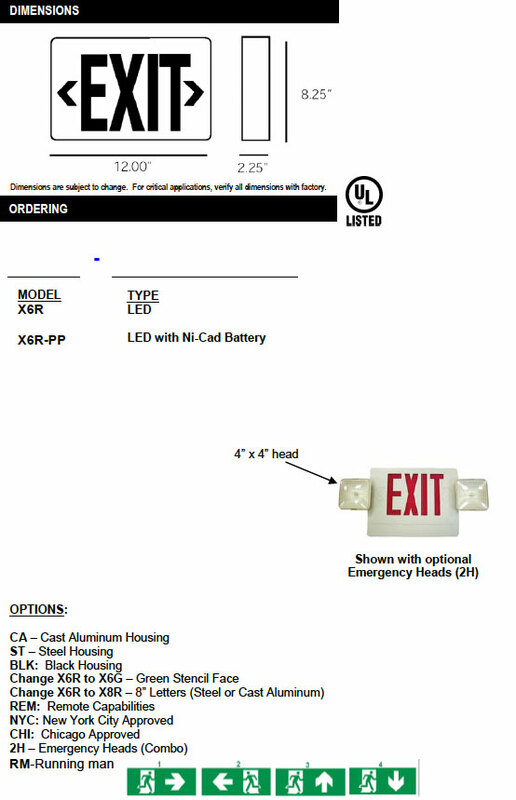 The X6R All-Purpose Exit Light is a slim, easy-to-install unit. It is a compact, all-in-one, snap-together unit. The light source is red LED technology, which provides uniform illumination. These units are provided with ultra-bright LED diodes. This reliable and cost-efficient fixture is ideal for any commercial or industrial application where high performance and contemporary design is required. Universal mounting single or double-face for ceiling end or back mount. Includes canopy and extra face. Standard white housing. Available option is black housing. To meet various local codes, units are also available with optional green letters. Knockouts provided for left, right, and double face arrows. Emergency models provided with solid state charging system and maintenance free batteries. Housing is constructed of thermoplastic material. Optional steel and cast aluminum housings. Supplied with replaceable, sealed Nickel-Cadmium battery. 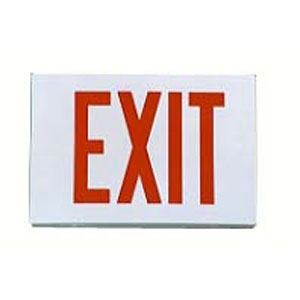 Provides a minimum of 90 minutes of continuous emergency illumination.